- Groups start as shown (Be sure there is plenty of space for the attacker to run into (25-30 yards if possible). - Attacker attempts to run through either the red or the blue gate across the area from them. - Defender attempts to tag the attacking player. - Switch lines after each go; be sure to switch roles so players are going from the left as well. - Can I take space with speed to get through red gate (beat defender with pace)? - Is the defender going to cut me off? Should I change direction? - Timing and technique of changing direction. 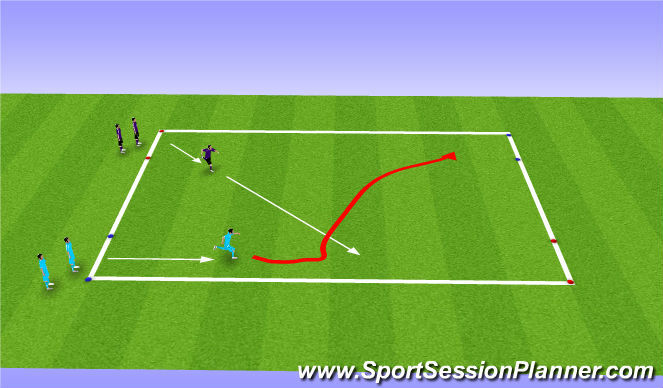 - Players leave on defender&apos;s first step if attacker is having too much success sprinting and taking space. - Players begin in 2 lines (L). - 6-8 players per group, ball/player. - Go to end of next line, prepare to go opposite way down. - Play for given amount of time, switch directions to work on opposite foot. - C drives into space ahead with ball. - B gets infront of C at which point C perfroms a Ronaldo Chop and cuts into the space inside. - Rotate B to C .
- Work on both sides. R - remove passes. Begin on eye contact or player C&apos;s first touch. P - player B is live on Player C&apos;s first touch. Play live to respective endlines. 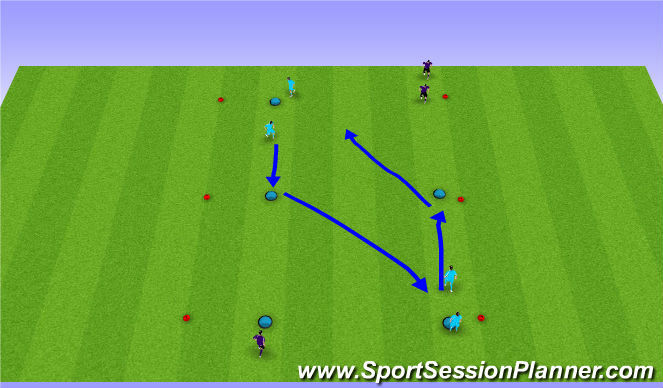 - Defender (blue) plays pass across to attacker (white). - Defender may leave on attacker&apos;s first touch. - If defender wins the ball, he tries to score in the PUG. - Quality of first touch. - Decision; continue to drive forward or change direction? - Timing, technique, quality of technique. - Play from both sides. - Defender can defend as soon as he passes. 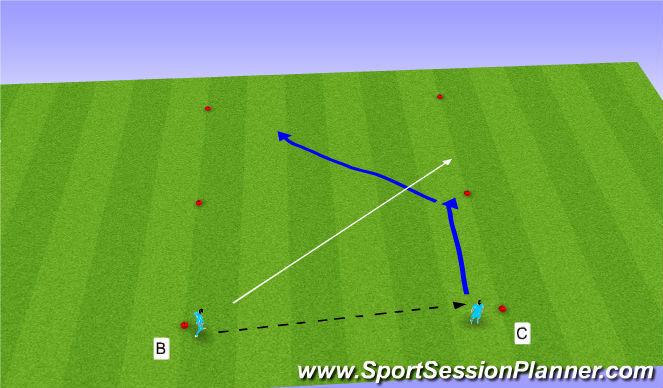 - Regression (if unable to pass successfully) - play on attacker&apos;s first touch into space.